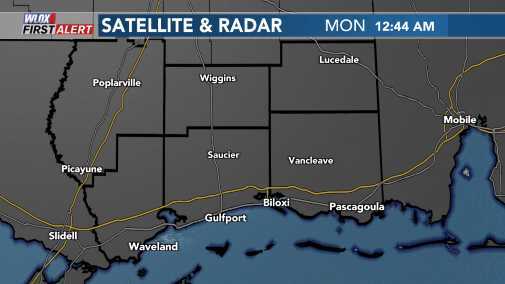 We are going to see some heavy rain move across South Mississippi overnight with the possibility of some strong storms embedded in the heavy rain. Keep your WLOX First Alert Weather App notifications ON for the overnight hours tonight. The models have not been agreeing on movement or timing of the showers and storms over the next few days. Our rain chances will increase as a shortwave moves toward and then through South Mississippi. The rain will last into the early morning hours of Wednesday. It is possible, though not likely, one or two storms could produce hail, but we do think we will see some pockets of heavy rain. However, our overall severe weather threat is very low. Patchy fog could also develop by the morning. Temperatures will stay mild to warm with highs in the 70s and lows in the 60s through at least Saturday. Scattered showers will continue Wednesday, Thursday, and Friday courtesy of a warm front. The models are not in agreement on when a weekend cold front will pass, but there will be rain increasing later Saturday and through Sunday. There will be a temperature drop once the front passes. Lundi and Mardi Gras will be chilly with highs only in the mid 50s. But it looks like sunshine albeit chilly on Tuesday.